Last year, after 4 years of sponsoring Curtis Nelson, PASALB made the move to be the proud sponsor of our manager Derek Adams, and it was a great year for Derek! Naturally we want to continue this and sponsor Derek again, hopefully to more success, and we very much hope you will support us and the club yet again and help us reach our target of £980. 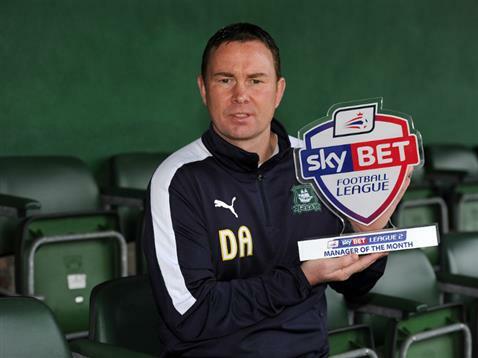 As we did last year, we can raise funds from fans outside of PASALB if needed, but if we can raise at least £700 of the total from PASALB members, the sponsorship will be in our name, so please pledge something to help make Derek Adams our man! Prize 2: A unique signed and framed Derek Adams training top which will be presented in person by Derek at our annual ‘Meet the Manager’ event in London. In additions, as sponsors, we get 10 free match tickets to donate to charity and we will, once again as we have for the last five years, donate these to the NSPCC to be used for children who couldn’t otherwise get to Home Park. We know they really appreciate it. Funds should then be sent by bank transfer to the PASALB bank account (Details: sort code 77-91-43; Account 80963460) If doing this please use your name and DA as the reference, for example ‘Mark Jones (DA)’. If you prefer to pay by cheque please let Richard know when you email him your pledge. Please make payments by the end of July 2017.